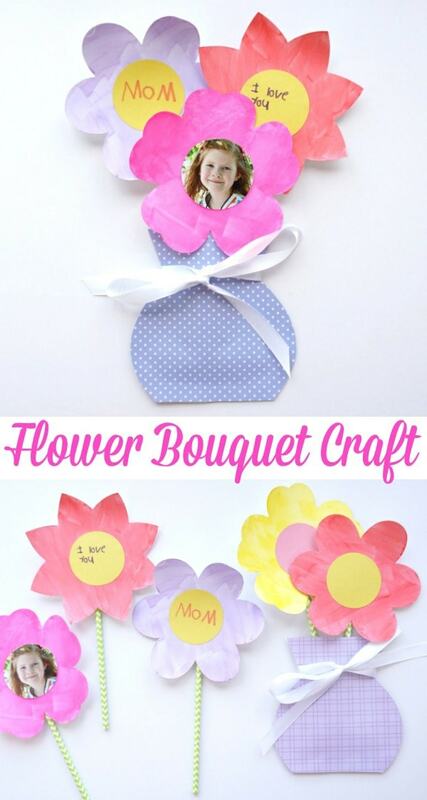 The colors of spring are in full bloom right now making it perfect timing to enjoy a fun spring flower bouquet craft. You can hang these colorful flower bouquets up on display at home or in the classroom to be festive for spring, or personalize the flowers to create a flower bouquet as a precious Mother’s Day gift for Mom or Grandma. Using Oriental Trading’s pre-cut watercolor flowers makes prep for this fun flower craft a breeze. The set comes with several different variations of flowers so children can use their own unique combination of flowers and can paint them with a variety of different watercolors when creating their flower bouquet. 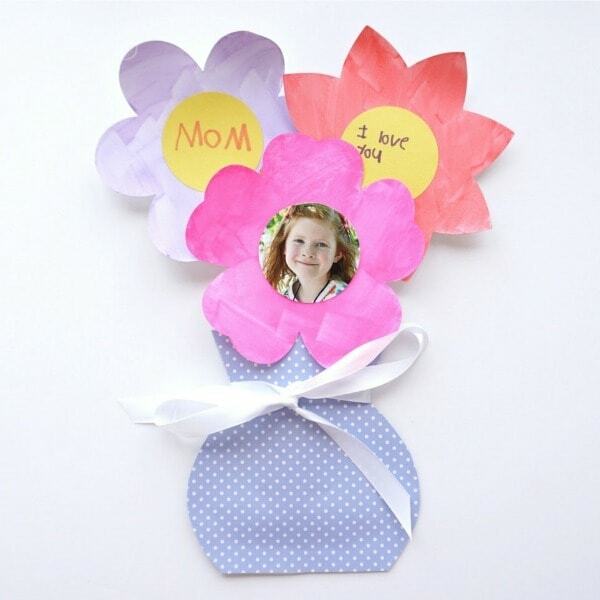 For a fun twist, personalize the inside of the flowers with photos and/or love notes and use the bouquet as a sweet Mother’s Day craft. Mom or Grandma will squeal with delight when they take a look at their flowers and they will treasure them as a keepsake forever. Head over to Fun365 to see the full supplies list, detailed instructions and to grab the free flower vase printable. 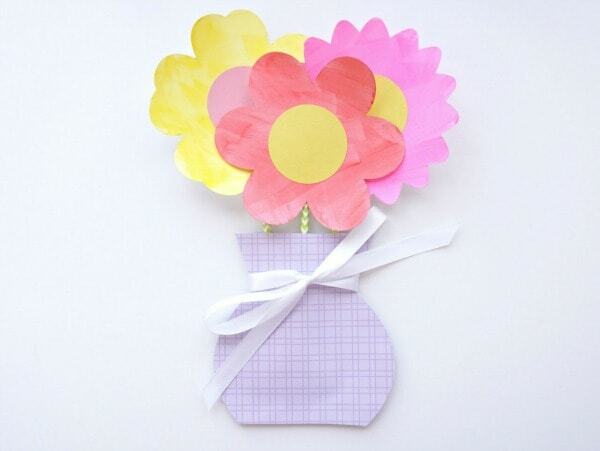 While you are there, check out more of their fun spring craft ideas and Mother’s Day crafts. 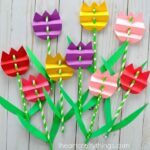 These paper straw tulips are super easy to create with construction paper and paper straws and they would also look darling displayed in a vase. We love enjoying Hyacinth flowers every year in our front yard. Here’s a simple way to create a beautiful paper hyacinth craft. Here is another way to create a flower bouquet craft with colorful paper doilies. You’ll love the unique way we folded our craft paper to create the bouquet. 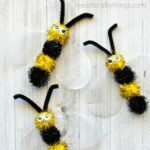 Looking for more fun spring crafts? This ladybug and butterfly stained glass craft is a perfect art project for spring time. 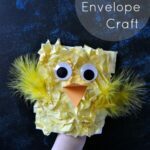 Observe some colorful birds around your home this spring and then head indoors to create these awesome paper birds. The accordion fold wings make them look like they are in flight. Kids will not only love creating this beautiful butterfly craft but they can use it as a puppet afterwards and enjoy watching their butterfly fluttering above the flowers on their paper plate. « 10 Fun Fish Crafts for Kids they are going to love!